Cricket was the first popular sport in Christchurch – a team was formed in 1851. Canterbury teams later dominated the game in New Zealand. In February 1864 the visiting All-English team of 11 cricketers played a team of 22 Cantabrians. Despite the imbalance between the teams, the English won by an innings and two wickets. 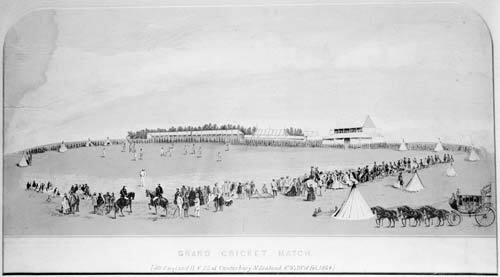 This lithograph depicts what was dubbed the ‘Grand Cricket Match’.